KELLI // "How do I start?" That was the question I asked myself a year ago. How do I start taking care of myself? How do I start making myself feel better? How do I change? I’ve always struggled with my weight. When I was younger, I was always the bigger one of my friends despite an active swimming and waterpolo regimine. I learned to ignore it. My weight got worse when I went to college. I would occasionally work out while regularly eating out with friends and indulging in all the food college kids eat. However, my weight really got out of control during a very stressful graduate school stint that I wasn’t ready for, and that’s when I realized: I was 25 and over 200 lbs. I needed to be more mindful. For years, I tried eating less, cutting carbs, zumba, running, swimming, really the list is exhaustive. For my wedding at 27 - I basically stopped eating for 3 months to fit into my dress. I lost 15 lbs, but gained it immediately back by the end of the honeymoon. For another two years I would yo-yo back and forth, losing 10 lbs, gaining 9 lbs back. At some point, my doctors diagnosed me with Polycystic Ovarian Syndrome, which made it difficult for me to lose weight. I used that as an excuse for another year for why I wasn’t seeing any progress. Finally in March 2017, I literally didn’t fit into any of my clothing. I had heard about weight loss transformations and did research for a few months as I hemmed and hawed at the commitment, time and money. I felt it was a huge investment, and like all my other attempts, would probably fail spectacularly. I managed to lose some weight though medication and stricter diet. Then I found Imago Fitness through a random exercise class Groupon and, like a creepy stalker, read EVERY SINGLE TESTIMONIAL on their site. I kept going to this class and kept seeing the girls I had read about. Kashana, for example, is a real person, and she looked even better in person than she did in her pictures. 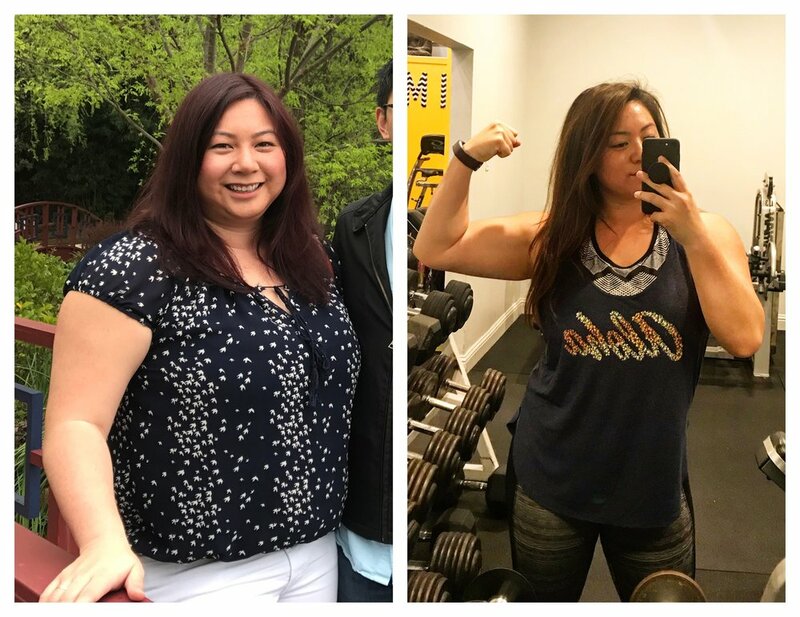 I made an appointment with Coach Huong and had a nerve-wracking sit down to talk about starting my weight loss journey. She explained that the program consisted of a regimented meal plan, cardio, and weightlifting. I immediately was like, “No Weight Lifting.” I was already really muscular, and I didn’t want to get any bigger. It was also super intimidating since I hadn’t lifted weights since high school and really had no idea how certain things worked. She gave me this slow half smile and calmly told me that she would be with me every step of the way, that I wasn’t on my own, and to just wait and see. In 12 weeks, I learned to meal prep healthy, filling food. I learned to make better choices when eating out. I’ve learned how to weight lift properly and am still expanding my knowledge. I learned about the importance of cardio, both fasted and non-fasted. I learned more about myself and how to manage my feelings about food. During a recent stress craving, I found myself snacking on hummus and pita bread when before I would have ordered a burrito or pizza. More importantly, I learned that I’m not in this alone. I learned more about myself and how to manage my feelings about food. More importantly, I learned that I’m not in this alone. The team at Imago is really priceless. Coach is completely steadfast in her partnership with you. Sarah is constantly pushing you to challenge yourself while being your endless cheerleader. All the girls are supportive, helpful and always willing to help you figure out an exercise or tell you the best place to buy a Chanel purse. Every single one of them has given me encouragement at some point in my journey. It really is a community, not just a gym. I also roped in my friend Vicky, who joined Imago earlier this year, so it’s even more awesome to have her as a part of this wonderful family. Read about her journey as well. My first transformation, I lost 21 lbs with Imago and 16 inches from my body. I can proudly add that 15 lbs I had lost prior to joining Imago for a total weight loss of -36 lbs over the course of one year. I’ve also managed to keep off any extra weight and I’m not done yet. I’m currently in my second program with Imago to help me reach my next goal! I feel and see my body changing. I feel stronger. I feel healthier. I feel much more able to take on the challenge of my health.